It’s been a great September here at EEDS and we’ve got more awesome music on the way. A week ago we joined Bateria Quilombola as they performed at the Brazilian Rhythms Festival at the Quilombo Cultural Center. We had a great time with them, special guest Dudu Fuentes, Dill Costa, Luciano Antonio, Heitor Garcia, John Beard, and Capoeira Angola. Thanks to everyone who organized and participated and especially to all the lovely people who came out to hear the music! UPDATE: We have had to move our class start time back 1/2 hour for the foreseeable future. We will begin at 7:30 and go until about 9:15. The schedule below has been updated to reflect this. We will meet at the regular time for a short rehearsal and then retire for drinks, snacks and good times! That’s it for 2015, we will jump back into it ASAP in the new year and then it is full steam ahead until EEDS Carnaval 2016 (Date TBA)! 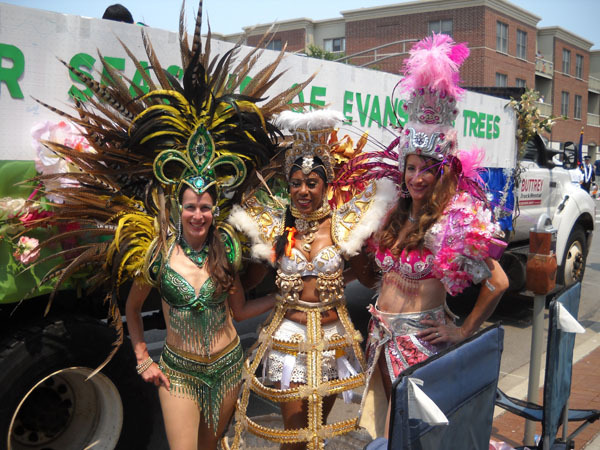 We are getting very excited for samba this weekend! EEDS has been working with Bateria Quilombola​ to prepare for two great nights of Brazilian music. Tonight (9/18) there is a workshop with guest artist Dudu Fuentes at the Quilombo cultural center. The workshop runs from 7-9pm, $25. Then tomorrow (9/19) we have an awesome night of all things Brazilian music lined up at the Brazilian Rhythms Festival! The festival starts at 830pm and runs until 12am, $10 suggested donation. We’ve all been practicing hard and hope you can come join us for these two awesome events! At this time we are postponing the beginning of regular sessions for the beginners class. If you are interested in beginners classes please send us an email. Reed will be talking with those who have expressed interest to come up with a time and location that will work best. The beginners class is designed for those who want to get started playing samba but are looking for a slower paced environment than the rehearsals at our normal Wednesday classes. Also welcome are those who already have been playing samba and are looking to get experience with new instruments before trying them out with the larger group. 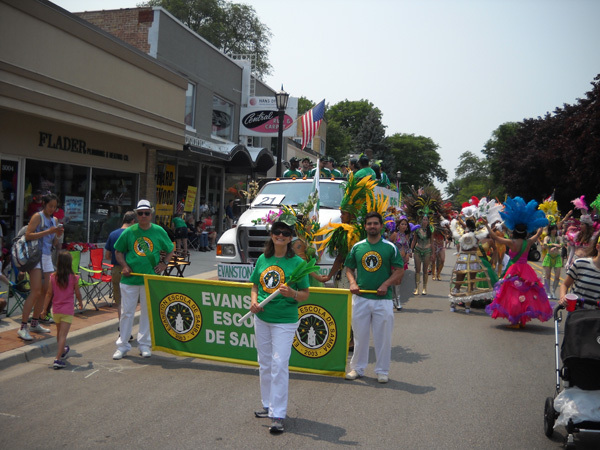 For the fourth time in six years, the Evanston Escola de Samba was awarded 1st place in the Performance category at the Evanston 4th of July Parade! This is our fifth consecutive award from the parade judges. Our dynasty-in-the-making is the product of hard work from so many people, and we want to thank them all. First, thanks again to anyone and everyone who contributed to our successful Kickstarter campaign. None of this could happen without your support, and we thank you! Each year, scores of dancers, musicians and volunteers that make everything possible. They all give freely of their time and energy, and they continue to be the backbone of this organization. Special gratitude to the EEDS parade committee: Rachel Goc, Richard Adams, Lindsay Fullerton, and Matthew Rarey for spearheading the design of the float and costumes, and to the endlessly talented Dill Costa for choreographing a stellar performance in front of the judges. And of course, EEDS could not exist without the leadership of our executive director, Jessica Anzaldua, and our mestre da bateria, Reed Flygt and his partner-in-crime Peter Korajczyk. 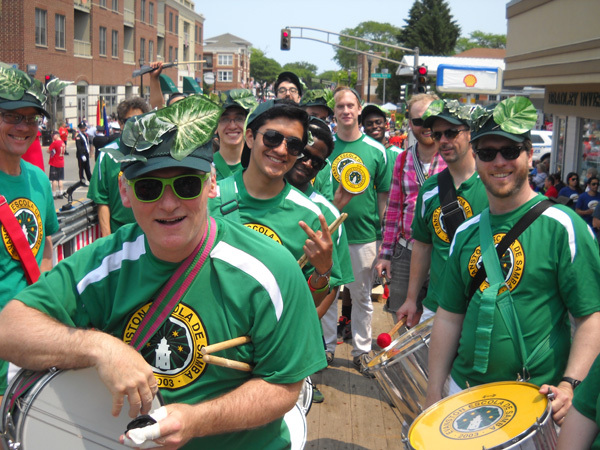 The drummers sounded better this year than they ever have, and we have their endless energy to thank! Thanks as always to the amazing Dill Costa, our head of dance and rainha da bateria, who crafted and choreographed our stellar alas of passitas and baianas. So many dancers come to EEDS from Dill’s classes at the Old Town School of Folk Music, and we hope to see you all year after year. The always-energetic Edilson Lima deserves special thanks for volunteering his time to the parade, and as always, a shout-out to our wonderful mestre-sala and porta-bandeira, Etienne Montanez and Zenaida Saez, who carry the EEDS flag proudly. Our bateria would never sound as good as it does without Reed Flygt, our fearless mestre. Special thanks to our Lane Tech bateria members, who brought so much fun and spirit to classes and the performance. 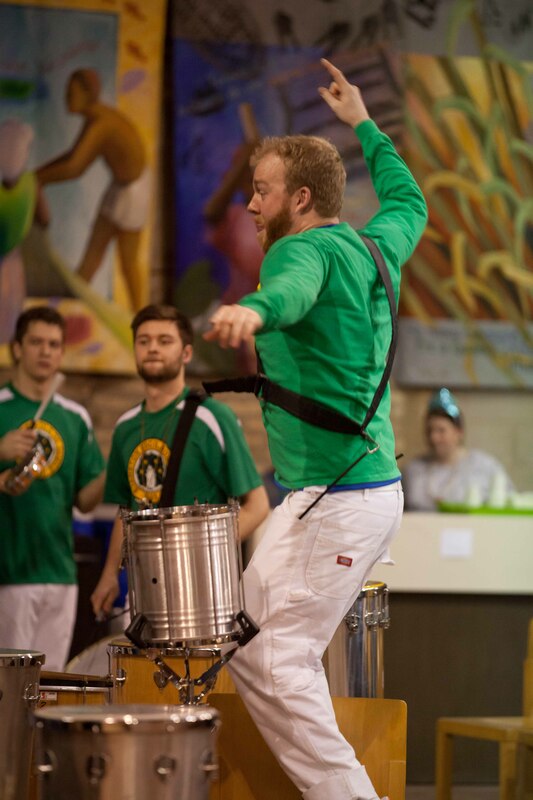 It goes without saying how much everyone at EEDS loves our friends from Bloco Maximo who give our bateria extra swing. Volunteers make everything better. 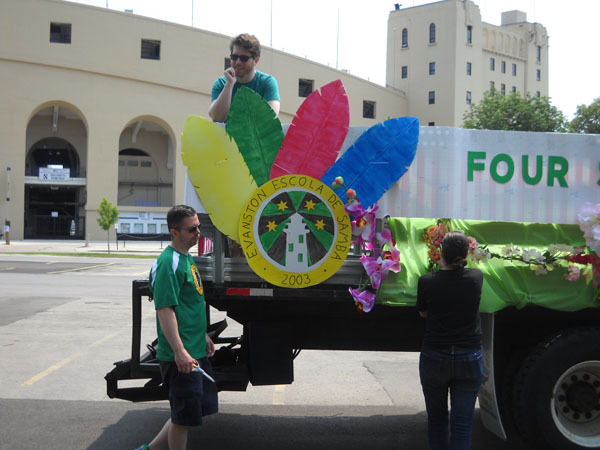 Our float this year came from the brains of the EEDS parade committee, built with the labor of so many great EEDS members and volunteers: including Eudald Lerga, Nate Cornish, and Rita Sacay. Ramiro, Jeff, Raymond Rarey, and Barbara Goc also deserve extra credit for their help on parade day. Finally, a thanks those who helped us record this fabulous event: our photographer, Mike Goc, and our videographer, Michael Rhee. In the coming days, we’ll be posting lots of photos and videos from the parade so you can catch some glimpses of our award-winning performance. 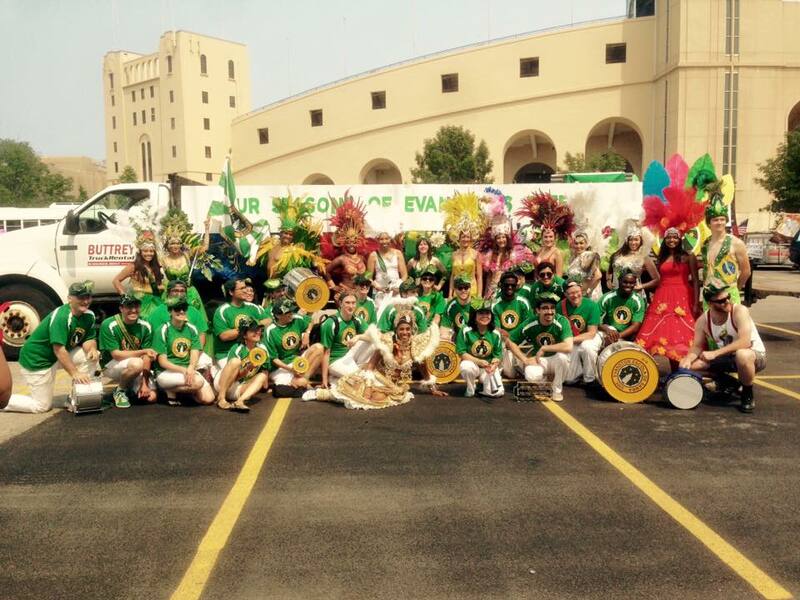 If you have any photos you would like to share – email them to evanstonsamba@gmail.com. Don’t forget to like us on Facebook, and follow us on Twitter and Instagram for more info on classes, workshops, and events (as well as some generally awesome photo updates). The 4th of July is just the beginning! Stay Tuned!